Bullying is showing up in our personal and professional lives. When I say the word bully, what immediately springs to mind? Is it the school playground? Do you think of it as a childhood thing that only rears it’s head in our developing years? Well, I’m about to burst your bubble, bullying is alive and well and shows up in our adult lives as well. As a coach I have worked with a surprisingly high number of clients who were subject to bullying in the workplace or in their personal lives. I am deliberately calling it bullying as it exposes it for what it is, psychological abuse. It comes in light and dark tones, however we need to understand that the form of bullying which people can be subjected to as adults, is a much more developed and insidious form, the skillset has been honed and sharpened. I visualise the bullying like this… Imagine a tower built with Jenga blocks, this tower represents the person who is on the receiving end of the abuse. The bully strategically works on destabilising the tower, firstly by subtly vibrating a block while still keeping it in place. Gradually the vibrating becomes more frequent and can build up to removing the blocks from the structure all together. The subtle wobbling of the Jenga block will be felt as a slightly unsettling feeling, a gentle undermining of confidence. Sometimes this is as far as the bullying goes, resulting in the recipient experiencing a continuous feeling of unease, ending up with them questioning their abilities and often showing the initial signs of a loss in confidence. This is how the bully establishes his/her sense of power, by literally feeding off the insecurities and self doubt of another. All this manoeuvring can be very subtle with devastating results. 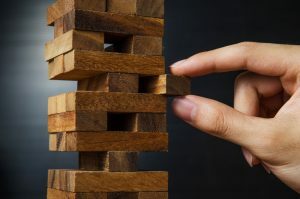 If the bully does not initially receive their hit of power by simply destabilising the person, they can move on to an ever increasing vibrating of the Jenga blocks, rocking the confidence and self worth of the individual, culminating in the destructive swaying of the tower, threatening collapse. This Jenga game can be played out at different levels in our professional and personal lives and it serves us to become aware that it does exist. This is not to encourage you to embark on a roller coaster of paranoia but simply to become aware of this power play. Remember this is not all gloom and doom, simply put, ‘knowledge is power’. There are people whose personal insecurities and self doubt are counterbalanced in their minds by undermining and bullying others. Are they consciously aware of what they are doing? That is open to debate! So how can we make sure that we can reinforce our Jenga tower if someone chooses to come along and play with it? Going back to the playground, how would you deal with a bully then? You would hold your ground. If you can develop a deeper understanding as to why a person is behaving in a negative way, it allows you to experience their need for control and to dominate as their weakness. What ever they are communicating to you needs to be understood as coming from a place of their self doubt and insecurity. It belongs to the oppressor not to you. This is the same whether it’s a boss, colleague, partner, family member… please fill in the gaps if applicable! We are often quick to accept full responsibility and think it’s all our fault, and while it is healthy to check in with ourselves and ensure that we are behaving in a way that sits well with us, we do need to be aware of possible mind games. The barometer is always, how does that person make you feel? Are you feeling supported and encouraged or undermined and destabilised? After reading this, if you feel that there may be some Jenga playing going on in your life, it may well be useful to see a coach in order to achieve a proper perspective. There is always a plan of action that will put you back into your own driving seat, I myself have witnessed some amazing turn arounds. Remember challenges make us stronger and there is nothing quite as empowering as holding your own with a bully. The important thing here is to take charge. I really hope this has been useful to you and also I must apologise as I’m sure that you’re never going to look at a game of Jenga in the same way again!